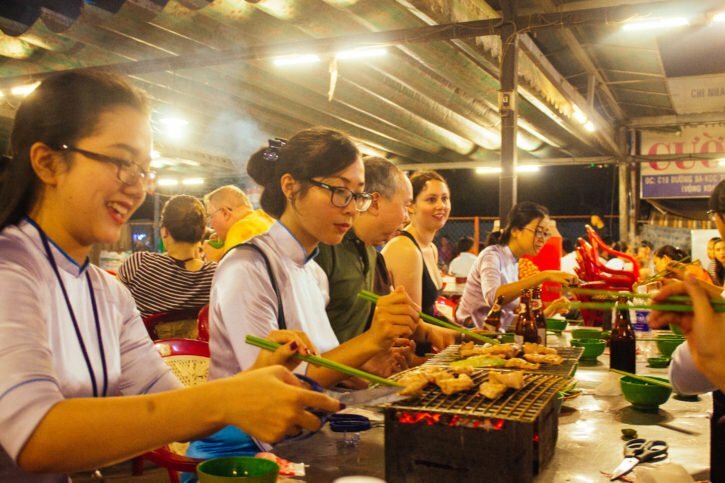 Discover the food scene and nightlife of Saigon on a Saigon food tour guided by XO Tours, Vietnam. You can feel the vibrancy as soon as you touch down in Saigon – the motorbikes whizzing by, the smells, the sizzling heat. At first, this whirlwind of motorbikes and smells turned me off of Saigon. But as I embraced the culture through a Saigon food tour, I soon discovered the beauty of the city and fell in love with Saigon. 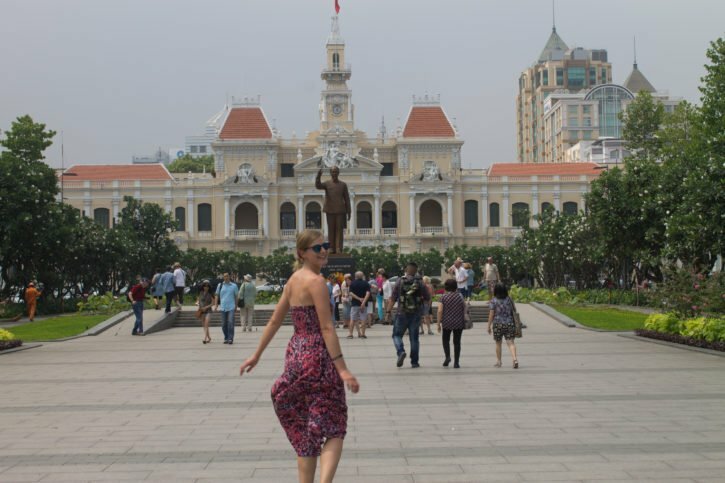 On my last Saigon adventure, I was overwhelmed. It was one of the first cities I visited in Asia and my senses were doing overtime. I didn’t know how to cross the street without having a heart-racing adrenaline kick each time, and I soon found out that the motorbike thieves are a real thing when one tried to grab my friend’s bag from behind. It was too much and I wrote off Saigon as a big city that I would never enjoy visiting. But as I sometimes find when I travel more, I couldn’t have been more wrong with my initial prejudice against the city. Flash forward three years later, and I had the chance to visit Saigon for a second time. One of my best friends from home was visiting Asia, and we planned to meet up in Vietnam for a few days. I set to work researching the best Saigon tours to experience and mentally prepared myself for what I remembered about the city – pure chaos. 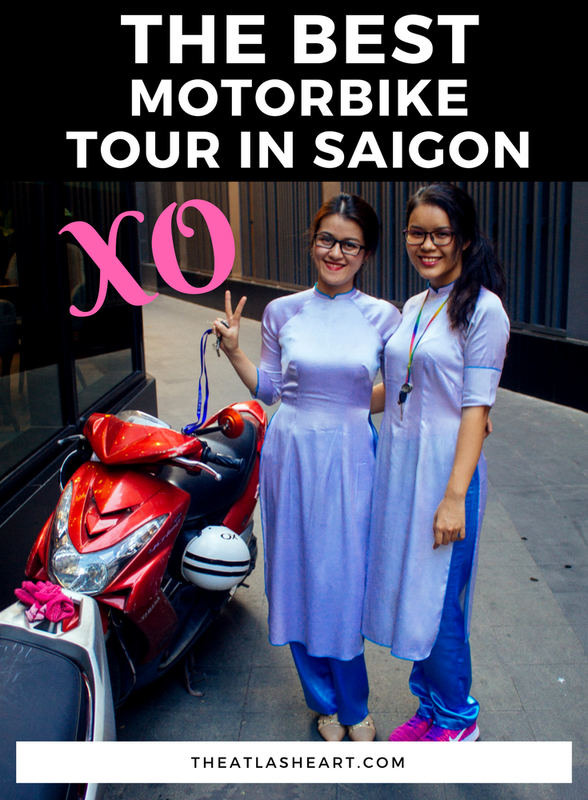 Through my research, I discovered XO Tours Vietnam, a female-friendly company that offers various Vietnam motorbike tours throughout the city and I was sold! XO stands for Xe Om, which are motorbike taxis in Vietnam. So, it’s a cute acronym. I looked through their tours and read a few XO Foodie Tour reviews and booked a spot on the XO food tour. 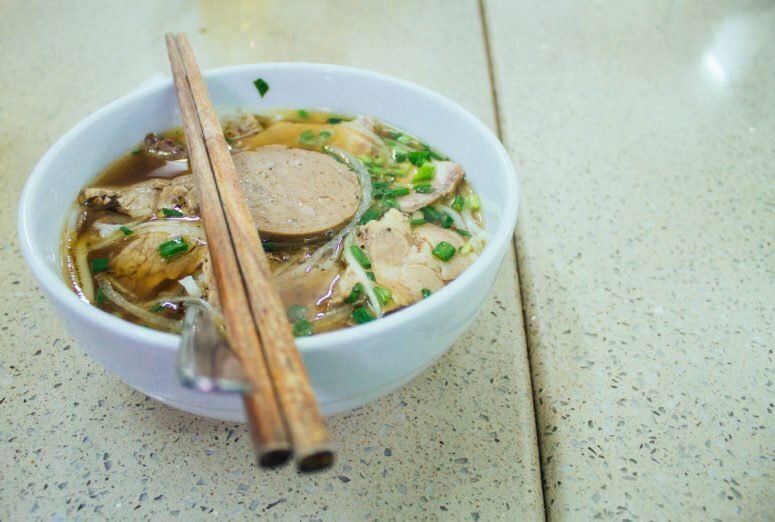 This XO food tour of Ho Chi Minh (another name for Saigon) takes you around the city as you enjoy some for the best Vietnamese food by motorbike. 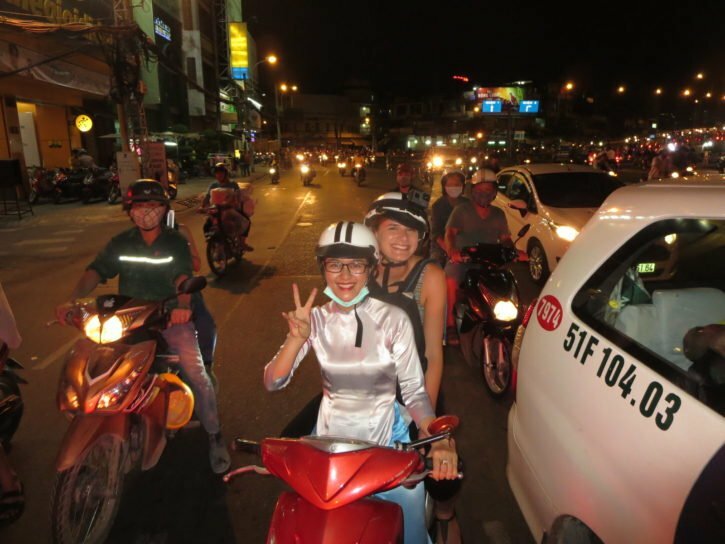 The aspect that drew my eye about XO, when compared to the vast amount of motorbike tours in Saigon, was the fact that all of the motorbike drivers are female. I thought that was so cool – especially since I was planning a girly weekend with my friend. Now, of course, XO bike tours are for males and females alike, but I do appreciate this component of girl power that is a part of their tours. 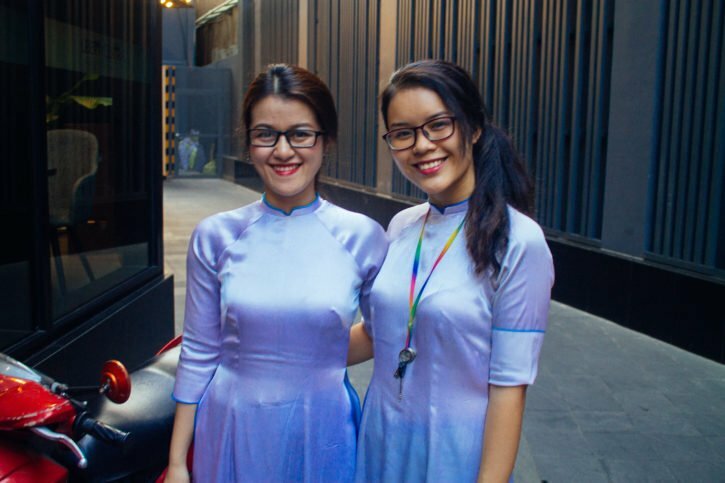 And the ladies that I met on the tour were a friendly bunch, who wore traditional Ao Dai outfits, expertly navigated the city, and easily spoke English to explain about city sights as we zoomed past. Unfortunately, my friend never ended up doing the tour with me. 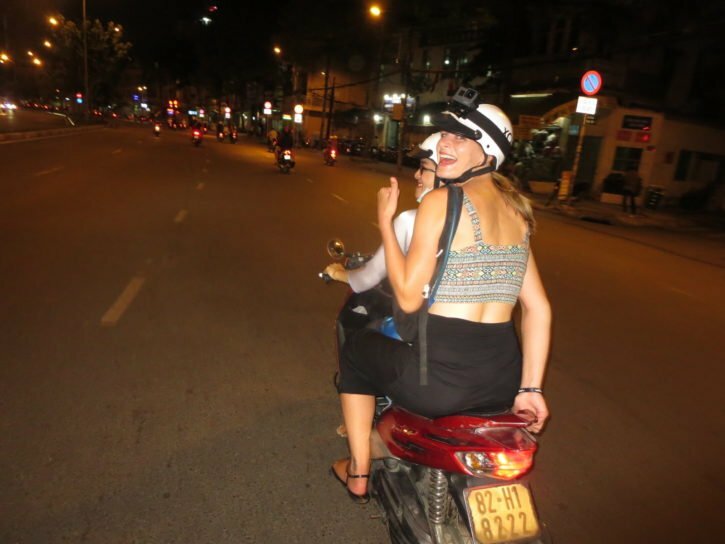 She had just been in a motorbike accident in Thailand a week prior, and although she thought she could handle the Saigon motorbike tour, as soon as she just got on the back of the motorbike she knew she couldn’t do it and wouldn’t enjoy it. I made sure my friend was okay, and we apologized profusely to the two women in their beautiful sky blue Ao Dais for the change of plans. I waved goodbye to my friend while I zoomed off into the beating heart of the city and was filled with excitement as my XO foodie tour began. The two beautiful XO ladies who came to pick us up – Binh 3 is on the left. 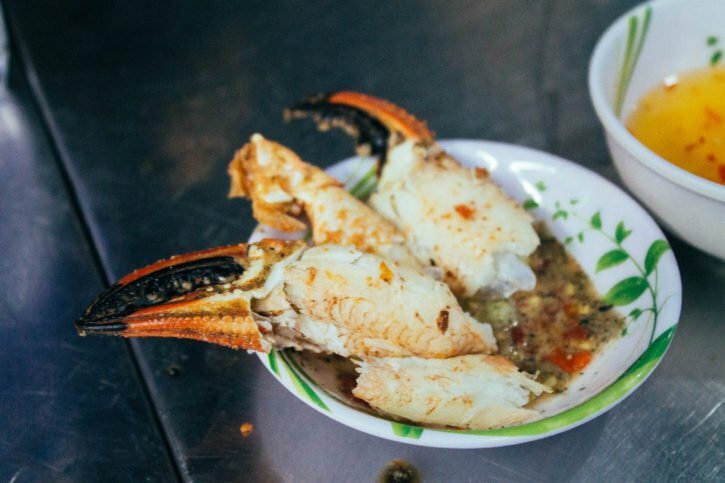 I was doing this alone now, but I was still excited to enjoy this foodie tour of Vietnam. I couldn’t wait for the new Vietnamese food I would try and the chance to see more of the local side of Saigon. By the night the Saigon Food tour rolled around it was my second night in the city, and I had already changed my mind about Saigon. Even taking the shuttle from the airport and looking out at the city for the first time in three years, I realized how much I had changed since I first came here. Instead of being a mess of frantic bodies and a busy city that gave me anxiety, I was looking at a city that seemed almost peaceful to me, especially coming from Bangkok. There was a method to the madness, I could easily see this time. The streets were wide boulevards, the crossings weren’t as heart-wrenching as I remembered, there were so many leafy corners and smiling locals ready to help if I felt lost. This wasn’t the Saigon I remembered, but it’s one that I quickly connected to and enjoyed. It was one of those moments when you realize how much travel has changed you. I had been in Asia for five months already, and before that, I had spent two months backpacking around the region three years ago. This wasn’t my first rodeo in the culture shock that comes with big cities in Asia, and I couldn’t believe how much more I liked Saigon after I’d become used to the region as a whole. In fact, it quickly became one of my favorite big cities in Asia after this trip. 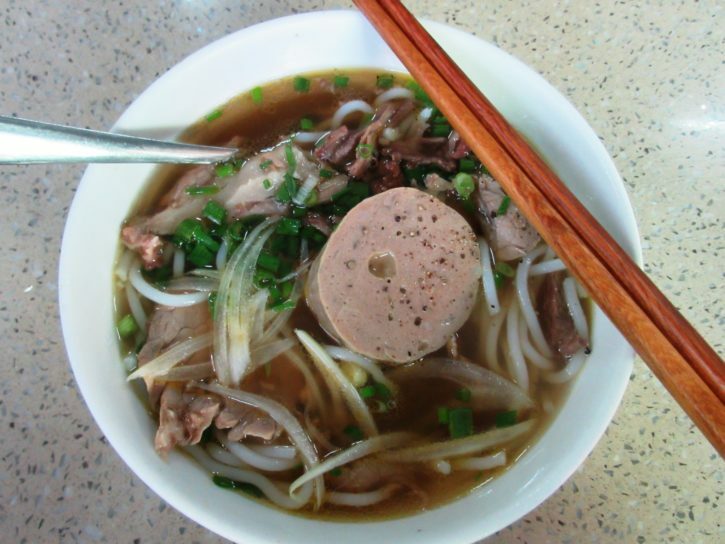 The Saigon motorbike tour I chose to do with XO was The Foodie Tour because I adore Vietnamese food. There’s something about the flavors of Vietnamese cuisine that sit well with me. The flavors are unique and fresh and there have been very few Vietnamese meals that I’ve tried that I didn’t like. The Foodie Tour had plenty of unique food to eat, such as these crab claws with chili. The Foodie Tour also sounded like one of the more comprehensive and in-depth tours XO offered, and I was ready to be fully immersed in Saigon. 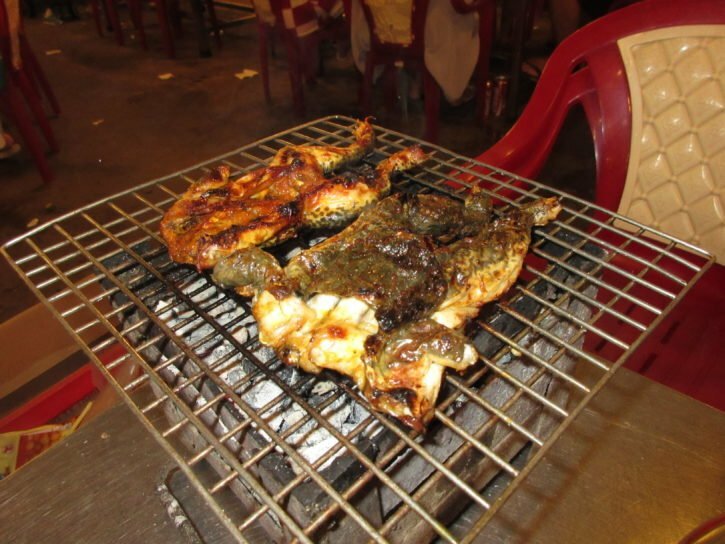 One of the many aspects I loved about the Saigon food tour is that it’s done by districts. For those of you who have never been to Saigon, the city is divided up into different districts, with district 1 being the main tourist and downtown area. Each district has a distinct personality (and flavor as I would soon find out) and that is how the motorbike tour was organized. Trying BBQ flavors on the Saigon street food tour in district 8. 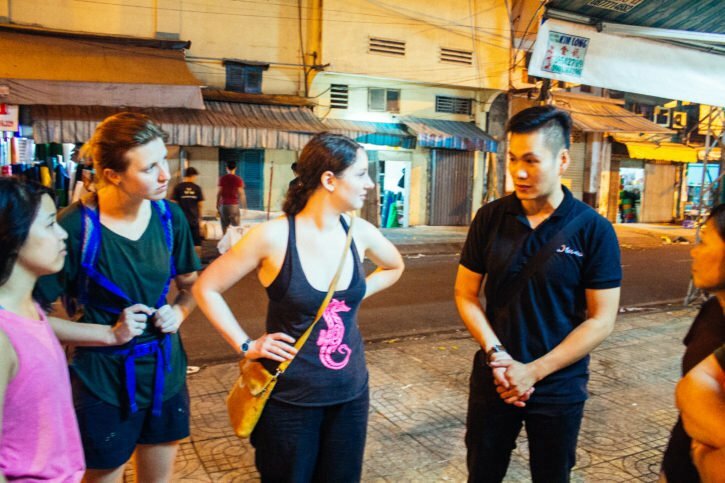 The XO food tour in Saigon lasts for a good four and a half hours, but the night went by so quickly with everything I was experiencing, it hardly felt that long. 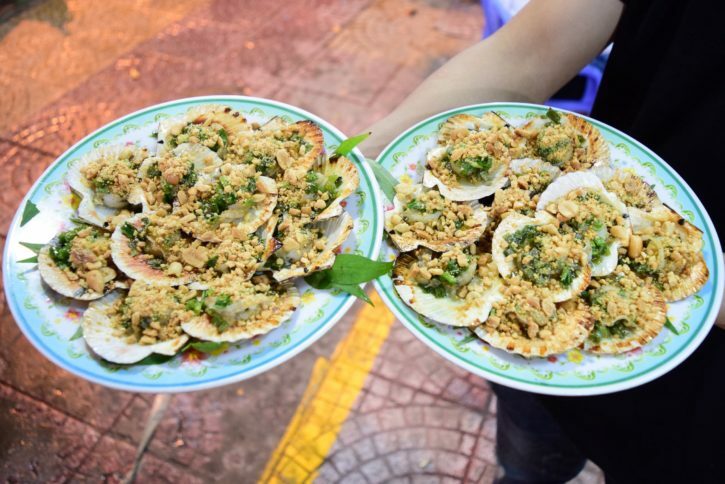 The Foodie Tour takes place at night because that’s when most of the Street food markets in Saigon are open, and this tour is really a Saigon street food tour – my favorite thing to try when I’m traveling in a foreign country is street food! 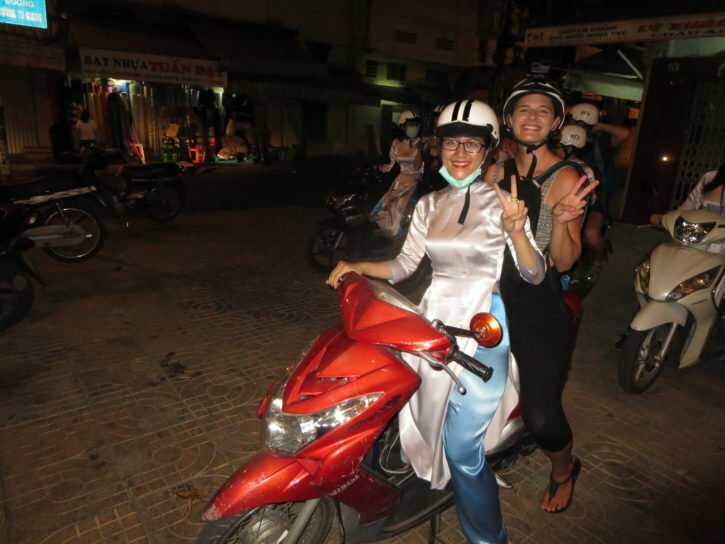 On this motorbike tour of Saigon, we went to six districts in total and had plenty to eat and drink throughout the night. There was always the offer of seconds if you wanted more food, although all of us were so stuffed we didn’t take advantage of that too much. There were also unlimited drinks (including beer, water, tea, soft drinks) so I indulged in a beer at almost every stop, as well as cold water to cleanse my palette. Starting with iced green tea for the first stop. Another aspect I enjoyed about the tour was the city sightseeing portion in between food stops. In order to give your digestion a rest and to learn more about Saigon, a good amount of the tour was riding around Saigon on a motorbike and taking in the city at night. And let me tell you, Saigon is a city that truly comes alive at night. 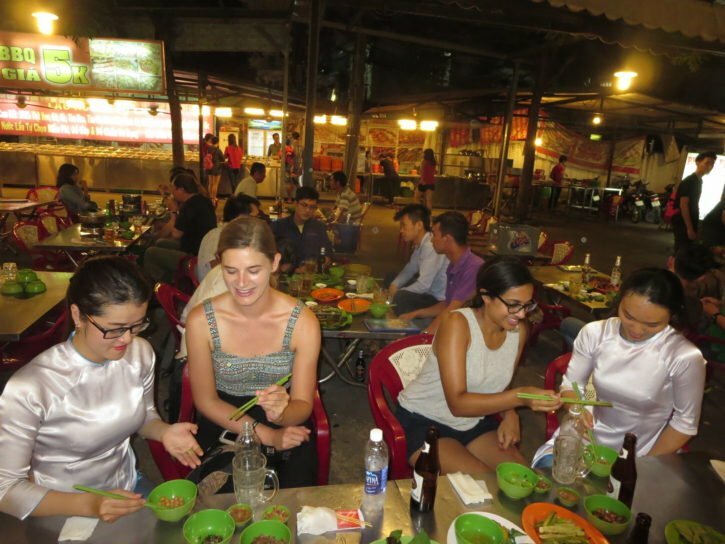 The Foodie Tour combines XO’s Saigon By Night Tour, so you get the best of both worlds – food & city sightseeing. My motorbike driver, Binh 3 (the 3 is there because there are three other Binh’s that work at the company), is a local to Saigon and was knowledgeable about a lot around the city. She was able to answer all of my many questions, and she also seemed genuinely interested in getting to know me and what life is like in California. Me with my awesome motorbike driver, Binh 3. Photo via XO Tours. She said that she loves working for XO because she gets to work on her English and meet so many new people. When I asked her how she started learning English, she said on YouTube. Talk about impressive! Man, I really need to try and teach myself a new language from YouTube videos, that is some dedication right there. The main tour guide’s name for the night was Tai and he was an engaging and hilarious Vietnamese guy, who was also very knowledgeable about the city and local cuisine. It seemed like he knew all of the Ho Chi Minh restaurants and which ones were the best places to eat in Ho Chi Minh. The leader for our XO foodie tour, Tai. Basically how the night worked was that everyone on the tour had their own motorbike drivers. 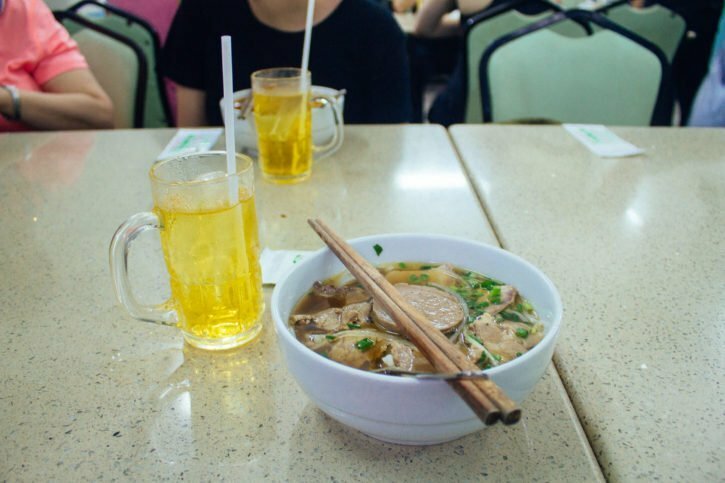 Once we stopped for Vietnamese street food, explored the best Vietnamese restaurant in Saigon, or to look at something in particular, Tai would take over and go into depth about what we were eating or about to see. During the meal, our motorbike drivers would show us how to eat certain dishes and what toppings to use if we wanted. Then we would hop back on a motorbike with our individual drivers and head off to the next stop on our Saigon motorbike tour. We generally sat with the same group of 4-5 people throughout the night to make it small and personal, even though the whole tour was about 15 people. For most of the night, I was with a middle-aged American couple and a solo female traveler from Melbourne, Australia. I also sat next to a girl from Sydney at one point, and got to know some of the other motorbike drivers while enjoying some of the best food in Saigon. My main group for the tour. Photo via XO Tours. 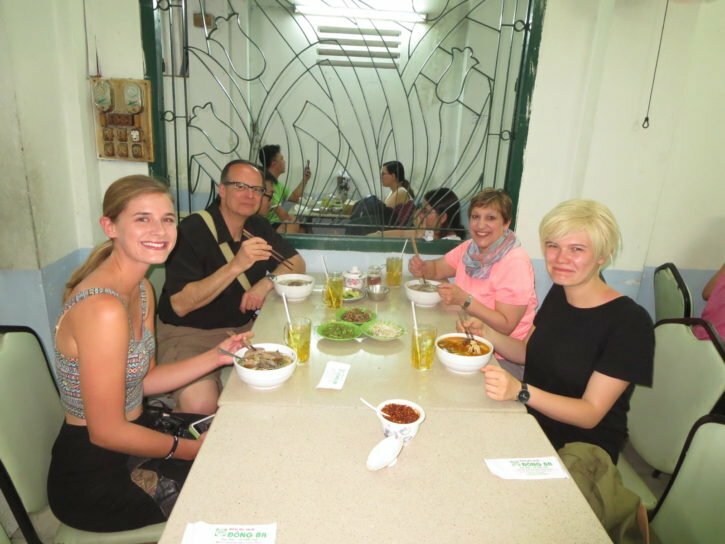 The girl from Melbourne was a vegetarian so I was able to see and taste test the animal-friendly dishes she was given at some of the best restaurants in Saigon, and they were just as good. I grew up in a mainly vegetarian/vegan household and I love vegetarian food, so I enjoyed seeing this side of Vietnamese cuisine as well. And, also to see how well the XO Foodie Tour catered to dietary restrictions. Binh 3 was patient when I asked her numerous times to teach me how to say certain things in Vietnamese. I practiced small polite words and sentences throughout my meals to test the unfamiliar syllables and intonations in my mouth – usually to the encouragement, glee, and friendly laughter of the other motorbike drivers. Our first stop of the Saigon food tour was in district 1 to try my first ever bowl of Bun Bo Hue. It’s basically the traditional beef pho you’re used to, but so much better! As you may have guessed from the name, the dish is originally from Hue, and it includes a heavy dose of lemongrass in the broth for a refreshing flavor. First dish of the night Bun Bo Hue. Photo via XO Tours. Popular toppings that you can add to the soup include shredded banana flowers (so good! ), morning glory, and bean sprouts. I, of course, tried all of them. Bun Bo Hue quickly because another Vietnamese favorite of mine and I was surprised that I’d never come across it before, even though I’d been to Hue. After district 1, our XO food tour made our way to Chinatown in districts 5 & 6. On the way, we rode through an outdoor market where people buy their groceries without ever having to leave their motorbike if they don’t want to. Tai talking about the history of Chinatown and the outdoor market with the group. There were too many smells to keep track of as we made our way through the winding and bustling night market, witnessing the local side of Saigon first hand that I love so much. We finally stopped at an open-air BBQ spot in district 8 for our second food stop of the night. I’ve grown to learn just how popular BBQ is in Vietnam since this recent trip, and it is really good BBQ. 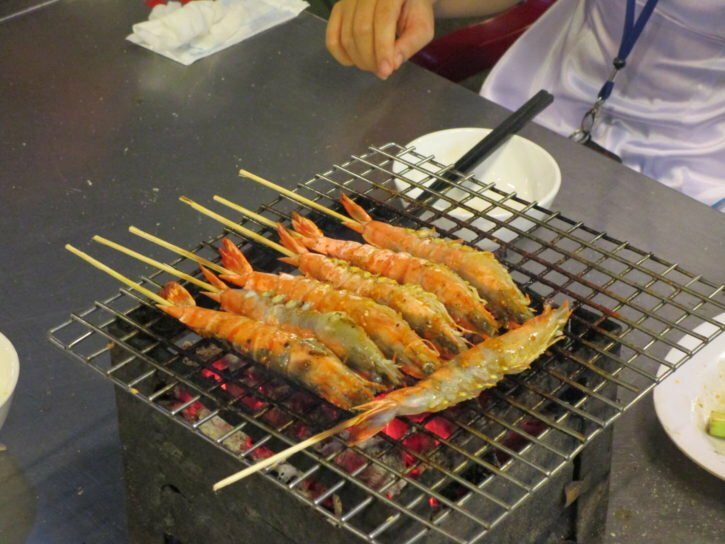 Prawns on the barbie during the XO food tour Ho Chi Minh. Photo via XO Tours. We had the option to try a variety of BBQ Vietnamese street food, including prawns, beef, goat, and frog. Again, I tried everything and learned that frog when cooked via BBQ is not actually too bad. The prawns and the goat were my favorite though. BBQ frog, skin and all. Photo via XO Tours. Binh 3 put two sauces in front of me and explained which meats went with which sauces. One was chili rock salt with kumquat for the beef, frog, and shrimp, and the other was a creamy tofu sauce for the goat. With each BBQ piece, you would wrap it in either a mint or basil leaf and then dip in the sauce and eat. After we were starting to burst at the seams, Tai announced that we were going to have chopstick wars. We were paired with our motorbike drivers and we had to work as a team to drop peanuts into a water bottle with only chopsticks. Drinking happy tea, aka rice wine at the 2nd stop of the Saigon street food too. Photo via XO Tours. It was a close race, but I ultimately lost to the other American guy and instead had a fun time cheering on the other people in my small group. Losing horribly at chopstick wars. Photo via XO Tours. On our way to the next stop in district 7, the sky opened up and it began to pour. Binh 3 pulled over and whipped out some snazzy bright ponchos and we were on our way again. District 7 wasn’t a food stop, but Tai wanted to show us this new district because of how different it is from the rest of the city. As soon as we hopped off and went over to listen to him, he said “welcome to Singapore!” And he was right. I spun around and was taken aback by just how much this district looked like Singapore. The streets were even wider than district 1, there was no trash, there were high rise apartment buildings and a lot of greenery. Tai explained that this is one of the newest districts in Saigon where the rich expats come to live and invest in property. He talked about how the difference in classes is stark here. There’s not much of a middle class, people are either really rich or really poor. The average income is $200 US per month, which gives you an idea of just how little most people live on. On our way to another district! Photo via XO Tours. The rich in Saigon move to places like district 7 and invest in property because they basically treat that as their bank. Instead of going to an actual bank, it makes much more sense for them financially to buy expensive property, because property values are consistently going up, especially in places like district 7. Whereas, the Vietnamese Dong has such high inflation that it’s not smart to hold on to it. It only devalues if you put it into a bank. Our last Saigon food tour stop for the night was in district 4, a district that even I’d heard about for its good local food scene. We sat down at a local restaurant as the only foreigners there and started having dish after delicious dish put in front of us. Another hit of the night, so diep mo hanh. So good! Photo via XO Tours. This was clearly the grand finale and there was so much good food to choose from. I tried quail with tamarind sauce, scallops with spring onion and peanuts (or so diep mo hanh), crab claw with pepper, chili, and salt, and I finally got to try balut – also known as fertilized duck egg. 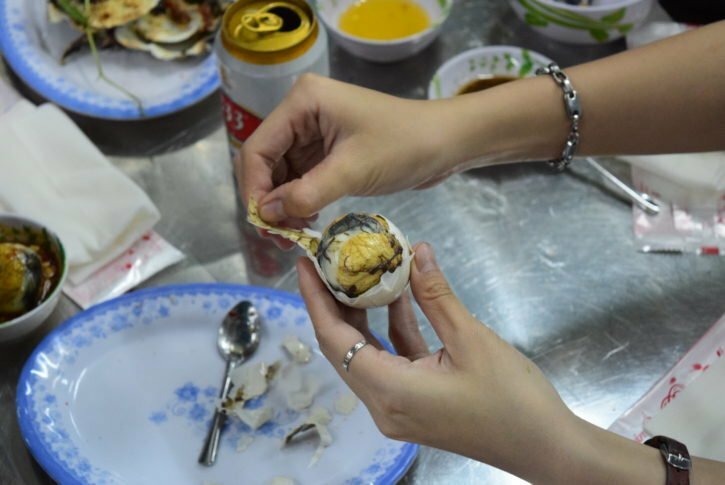 I didn’t realize that balut is popular in Vietnam too, I’ve just heard of it as a popular snack in the Philippines. I was excited to give it a go when Tai said that we were welcome to try an egg. Balut (fertilized duck egg). Photo via XO Tours Vietnam. I was the only one in the Saigon motorbike tour group to try it and I found it to be softer and nicer than I imagined. Fertilized duck egg, with feathers, beak, and all, doesn’t sound that appetizing, but Binh 3 found the best parts for me to try and that made it a bit more bearable. After our dinnertime, Saigon adventure came dessert. We tried Rau Cau Dua, which is a coconut flan of sorts, and some mild semi-sweet rice cakes. And then it was time to resist our food coma states to say goodbye and hop back on the motorbike to my hotel. The final part of the XO food tour, rice cake dessert. 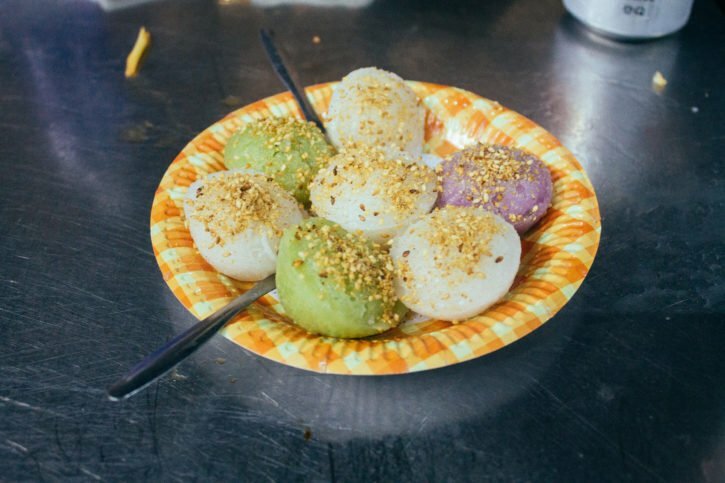 When I got back, I couldn’t believe how many new food finds I had discovered and how much I had seen around Saigon in the course of a night. I was still processing it for a while yet, and I was grateful to have been given a better glimpse into this local side of Vietnamese culture. Because, after all, food is a great way to better understand the heart and personality of a new place. The Reverie Saigon Residential Suites is a luxurious hotel option in the heart of Ho Chi Minh City. This stunning hotel boasts a mix of contemporary and classic European furnishings. The Reverie Residence offers guests an outdoor pool, in house spa and either modern or classic rooms. The hotel has three on-site restaurants that specialize in a variety of delicious cuisines. I stayed at the Liberty Central Saigon Citypoint Hotel and I had a great time during my stay. Located right in the heart of Saigon’s district 1, this stunning hotel has a rooftop bar and pool, fitness center, salon and spa for guest to use. Their rooms are modern and clean and have free WiFi. The staff at the hotel were extremely friendly and helped me anytime I asked. You can read my full review of the Liberty Central Saigon Citypoint Hotel here. The JOY Hostel offers guest clean and budget-friendly accommodations in District 1 of Saigon. The hostel is close to numerous attractions such as the Fine Arts Museum, Ben Thanh Street Food Market, Tao Dan Park, and Ho Chi Minh City Museum. Al of the rooms include a shared bathroom and some rooms have views of the city. If you need help arranging activities during your stay, the friendly staff will be happy to help you. 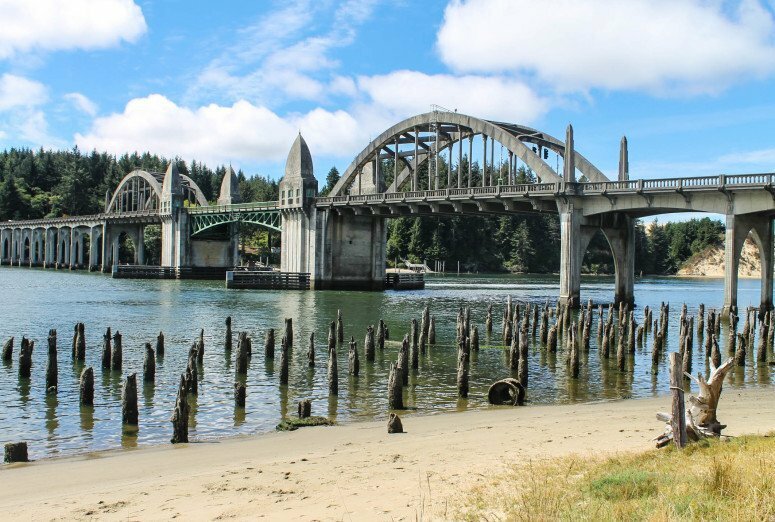 Find accommodation, book your rental car, or sign up for a local tour. Book a vacation rental on AirBnB (and get $40 off your first booking). Buy your Vietnam Travel Guide here. NEED HELP PLANNING YOUR TRIP TO VIETNAM? FIND INSPIRATION FROM THESE BLOG POSTS! Have you done a motorbike or foodie tour before in a foreign city? Have you been to Vietnam? Note: XO Tours hosted me for The Foodie Tour, but all opinions are always my own. Feel free to pin this image for future reference by clicking on the top right hand corner. 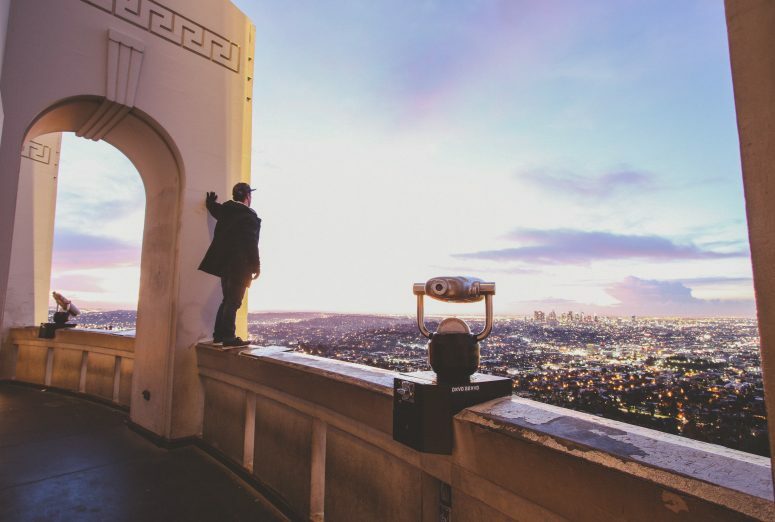 Get first dibs on travel updates, tips, and deals. Life is an adventure, join me around the world! Mimi founded The Atlas Heart to create a community of travelers inspired to see the world. 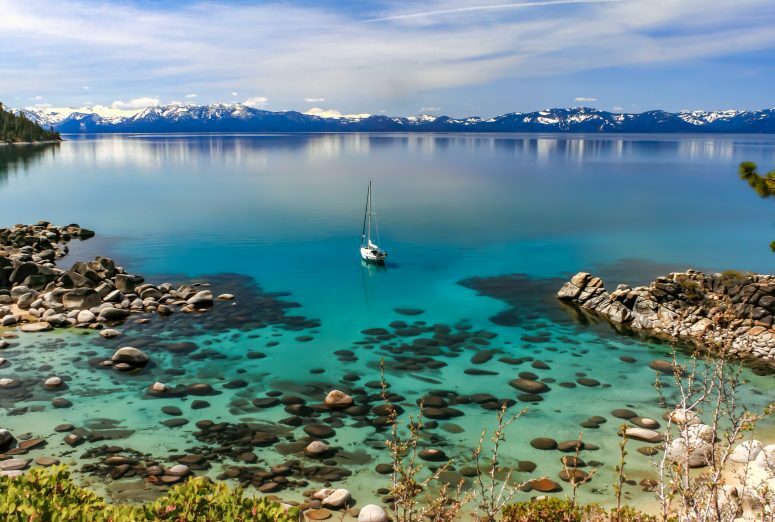 The Atlas Heart is a space where you'll find anecdotes on slow travel, craft beer, outdoor adventures, and all the eccentric bits in between that this world has to offer. What an amazing tour, looks like you had a wonderful time! But that fertilised duck egg and skin on frog made my stomach churn. OMG, I am sorry to hear about your friend, but I am proud of you for continuing with your trip. Looks like a great trip. Traveling alone has only recently come into my head. The fact that I don’t have anyone to travel with has put a stop to some trips. But you’ve inspired me to research for a local to guide me through the town. Thank you, Mimi! Thanks for stopping by and welcome to The Atlas Heart! 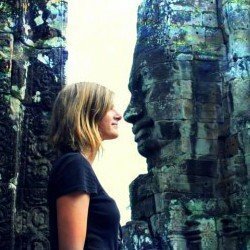 My name is Mimi, I’m an adventurous traveler who loves getting outside and getting to know local cultures through slow travel. My goal is to find a daily dose of beauty everywhere I go, to learn with an open mind, and to live with an Atlas Heart. After living abroad for five years in Australia, New Zealand, Thailand, Greece, and Portugal I have finally found a home in San Francisco, California. Join me on my journey around the world! © 2018 | Made with love by NUDGE MEDIA DESIGN.